Chronic renal disease is one of the most common ultrasonographic findings in older cats. 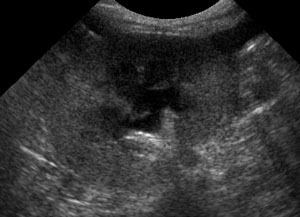 If you’re doing ultrasounds on cats, you’re sure to see signs of chronic renal changes on a daily basis. Today I’ll talk about the renal features to evaluate. Normal kidneys in cats are oval or bean-shaped. They’re shorter than canine kidneys, but also wider. The left kidney is located caudal to the spleen, and the right kidney is slightly more cranial and deeper when scanning in dorsal recumbency. The length of the kidney should be 3.8-4.4 cm, and the surface is smooth and regular. Compare the echogenicity of the medulla and cortex to the spleen and liver. The order of echogenicity, from hypoechoic to hyperechoic is medulla, cortex, liver, spleen, prostate. Try the mnemonic, My Cat Loves Sunny Places. The cortex should be about twice the thickness of the medulla, and you should be able to differentiate them easily. One of the things you’ll hear in describing kidneys with chronic changes is “poor corticomedullary distinction”. If you compare the first image (normal kidney) with the second image, you’ll see that there is less difference in the shade of gray between the cortex and the medulla. The change in echogenicity implies that there is alteration of the composition of the renal tissue. Compare the echogenicity of the cortex to the spleen and/or liver if possible (it can be hard to get them in the same image) since both the cortex and medulla can be affected. Measure the length of the kidney, and note the surface contour. The second example here is normal in contour and size (scale not shown). Renal infarcts look like wedge shaped, hyperechoic areas when acute (base toward the periphery), and an inward defect when chronic (fibrosis and scarring). They can drastically alter the shape of the kidney. The second kidney has two other common abnormalities; pelvic dilation and mineralization. The anechoic area in the distal third of the kidney is the dilated pelvis. This is normally a potential space, with no visible fluid within it. Certain diuretic conditions such as fluid therapy or polyuria/polydipsia can dilate the pelvis minimally, but more than that is pathologic. 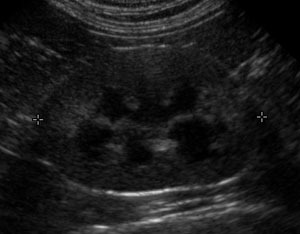 Kidney with pyelectasia (renal pelvic dilation without loss of renal tissue) may have previous or current obstruction or pyelonephritis. Mineralization can occur in the pelvis or the parenchyma. In the parenchyma, it is often an irregularly shaped, hyperechoic focus with distal acoustic shadowing. Take care to differentiate this from the arcuate vessels, which are very echogenic, but look like double parallel lines. The second example kidney has some mineralization of the pelvis. You can see the faint acoustic shadow on the left side of the pelvis. The right side of the pelvis is normal echogenic pelvic fat. This can be hard to tell from a pelvic stone that’s at risk for obstructing a ureter. All of the changes above are chronic and progressive. Regardless of the underlying disease, the kidney tissue becomes replaced by fibrous tissue over time. The kidney gets smaller, the cortex often appears equal or greater thickness than the medulla, and eventually they become indistinguishable. A small kidney can be very hard to find, so use your anatomic and vascular landmarks (spleen, aorta, renal artery) if you need to. The last example kidney is barely visible within the surrounding mesentery. Although ultrasound is able to detect changes in chronic renal disease, it is not highly sensitive. Cats can have significant renal dysfunction without ultrasonographic signs of renal disease. Conversely, many cats cope with their chronic renal disease though they have severe ultrasonographic changes. The history and bloodwork are important in assessing the significance of the findings. 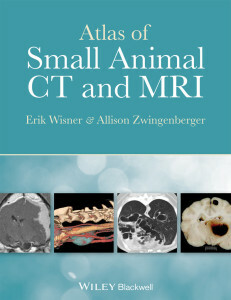 These changes are also non-specific, so the underlying mechanism can’t be determined unless a biopsy is performed. Next week, we’ll talk about a tricky ultrasound examination; the cat with acute on chronic renal failure.